For those who are looking to stand out from the crowd, look no further. If there is a surefire way for girls who want their outfits to pop (and by pop, I mean really POP), neon is the way to go. Apart from highlighting (pun intended) your bright personality, fluorescent shades are also a way to add that bit of cheerfulness to your wardrobe. But with every bold fashion statement comes risks – be it neon being your current favourite look, or if you’re just testing out the trend – neon ultimately remains a tricky style. Remember, you want to look electrifying, not electrified. If you’re not used to wearing bright colours on a usual basis, neon colours could prove to be a daunting task. The trick is to take it slow – there is no need to plunge right into donning neon coloured apparel. Kick-start your neon journey with small accessories, such as jewellery and/or bags. Don’t underestimate the big power of these little items; while they are small, they definitely make up for their size with the ability to make even the simplest outfit look eye-catching. Move on to apparel only when you feel comfortable with sporting neon accessories. By now we should have established the fact that neon colours have the power to flash out your look. So, if you prefer a softer look to the otherwise harsh bright colours, pair up the fluorescent picks with neutral tones. Neutral shades include duller and more muted colours such as black, white, grey, brown and olive. This is a classic way to wear neon colours – it prevents the flashy hues from making an outfit look too over-the-top, yet also spices up an otherwise standard palette of neutral shades. Just like a red lipstick, neon colours may be tricky to maneuver in the sense that they have to match your skin tone for it to work. For example, popular shades like hot pink would go well with pale skin because it’ll add a healthy pink glow to your skin. Likewise, fluorescent yellow won’t be suitable for skin tones that have yellow undertones because it’ll just make you look sickly. That, however, is just a general rule of thumb. Don’t be afraid to try out different neon shades to find out which best suits your features. Other factors could come into play too, such as hair colour. Opt for structured pieces with sharp lines and clean cuts to balance out the flashy neon shades. Heavier fabric would also contribute to a chic look, as opposed to flimsy materials like chiffon. It helps tone down the bright colours for our visual senses are not distracted by for example, flowy cuts. In direct contrast to monochromatic colours, neon hues emphasise rather than flatter. They tend to enlarge your body and thus you have to be cautious when picking the right item. 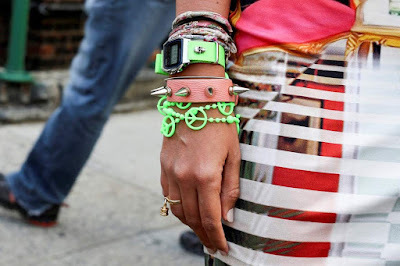 Wear neon at the body parts that you would like to bring out. For example, if you’re top-heavy, neon tops are not recommended – go instead for neon bottoms. This will draw attention to the lower half of your body and pull eyes away from the top half, and thus giving the illusion of a well-balanced body proportion. To keep the neon simple and not exaggerate the already attention-catching hues, pick neon dresses in classic cuts, such as the shift dress. The bright colours will do the job of putting a pop of colour to the simple style and it will still look classy. Congratulations on getting on to the end! Once you’re comfortable with flashing out the neon pieces, why not mix and match the colours to create full outfit. Neon colours generally work well together, but just remember to not overdo it. Pair the outfit with accessories of neutral tones, make sure that they go well with your skin tone, and more importantly, be comfortable! Are you sold on neon yet? How do you wear/intend to wear neon? Share your style tips in the Comments section below!